Fans of Leonard Cohen, you've waited patiently. Seven long years. Now it's finally here. Cohen's new album Old Ideas officially hits the streets next week. But it's now streaming online for free courtesy of NPR. It will only last a limited time. So settle in now and listen to the ten tracks, which as Guardian critic Kitty Empire puts it, are not about "death, betrayal and God, juicy as these are," but rather "the stuff that has made Cohen indispensable for six decades: desire, regret, suffering, misanthropy, love, hope, and hamming it up." Mr. Cohen is more than just a legendary musical artist. He’s an inspiration. A role model. A hero. A work of art. One of the last threads of a musical gentleman that we are still holding onto. I think a revolution could form in Leonard’s name. An attempt to regain what was once considered great music. Rejoice, friends, let’s cherish this great man’s career and his ability to put out a brand new album that will claim a place on the shelf next to his antique LP’s. 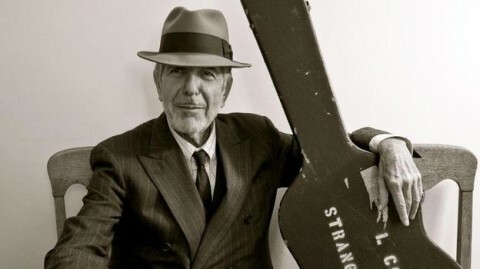 loving the new bradford cox cover of leonard’s song “seems so long ago, nancy”: http://pitchfork.com/news/45313-watch-bradford-cox-cover-leonard-cohen/. really loving his new album as well!